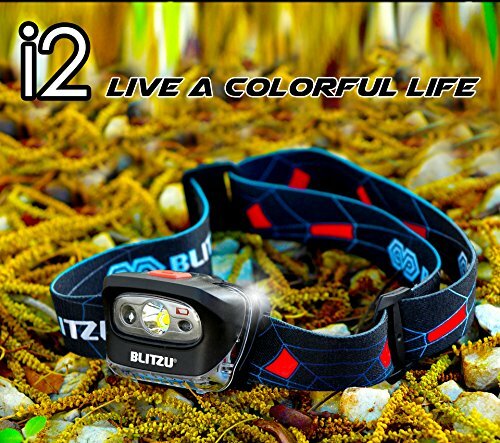 Introducing the ALL NEW i2, The Best Led Headlamp money can buy. It's POWERFUL, LIGHTWEIGHT, and STYLISH! GUARANTEE! - Camping, running, jogging, biking, mountain Climbing, hiking, walking your dog, and caving. - Training on trails, roads, deserts, jungles, beaches, and mountains. - Boating, kayaking, and canoeing. - Skiing, snowboarding, and hunting. - Fishing, and mountain Biking. - Search and rescue operations. - Automobile breakdowns and automobile Repairs. - Electrical, plumbing and any household work. Practical, Reliable, Durable with many features! - Super Bright Headlamp - 165 Lumen of darkness-busting power for up to 110-meter of visibility. - 3 RED light modes, FLASHING, SOS & STEADY red light that make reading more practical. - Waterproof Headlamp. Water resistant rated to IPX5 - protects against splashing or spraying from any angle. - CE and RoHS certified. 100% satisfaction money back guarantee, and lifetime warranty. Click on the Add to Cart button NOW, and have your i2 Headlamp shipped today! 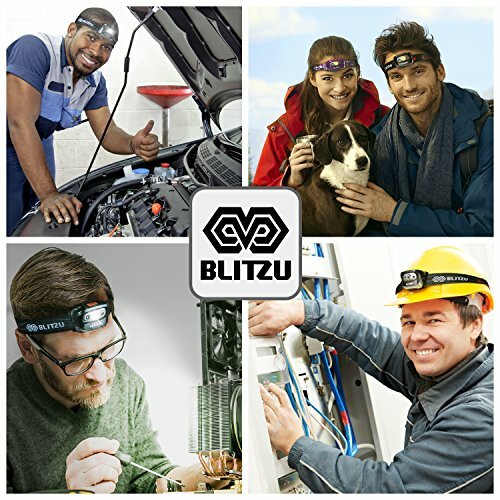 ✔ HASSLE FREE AND CONVENIENT - Improve your visibility instantly with hands-free bright lighting- No more struggle to hold a flashlight when you need both hands to perform any types of tasks. Leaving you free to work, read, and explore anytime, anywhere. 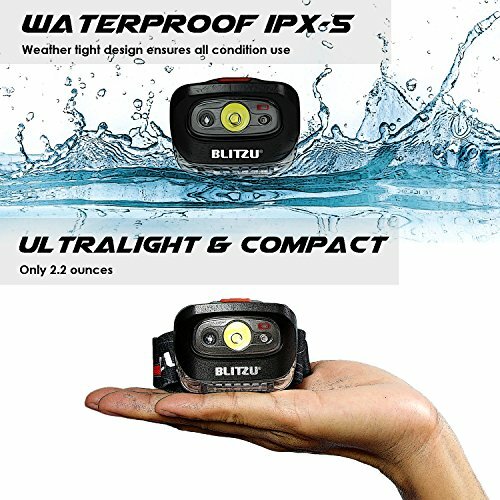 The Blitzu i2 is lightweight, with a compact modern design, making it easy to take with you anywhere - tuck it into your backpack, glove compartment or side pocket. ✔ INDESTRUCTIBLY BUILT - Made of durable, non-toxic materials. 100% child friendly makes this headlight the most reliable in its class. The super comfortable and stylish head strap is stretchy and adjustable to fit all adults and kids. Weighing only 2.2 oz. It's so light you won't even notice wearing it! ✔ ULTRA BRIGHT CREE-3W LED TECHNOLOGY- Your up-close detail work and long distance viewing is now a breeze. The sturdy headlamp body tilts up to 45° allowing you to focus light where you need it. 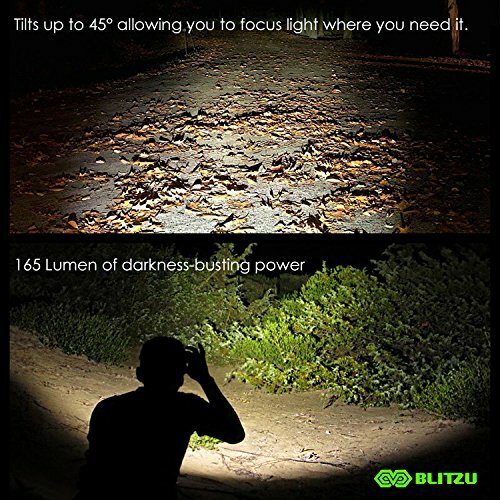 165 Lumen of darkness-busting power provides good field of view, plenty of peripheral light and is bright enough to light up large areas. ✔ WATERPROOF WITH 7 LIGHTING MODES - Cold and impact resistant. IPX-5 certified waterproof rating, protects against Splashing or Spraying Water From any Angle. 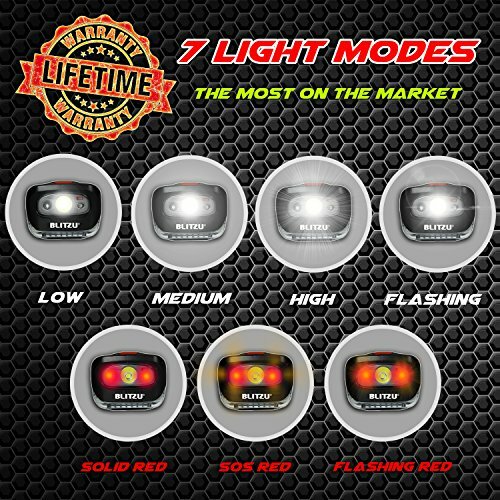 165 Lumen Led (300 Feet Beam) With WHITE & RED Lights + Wide Variety of Light Modes and 45 Degree Tiltable Body Makes this Headlight Brightest and Most Versatile in its Class. ✔ ORDER NOW WITH NO RISK! 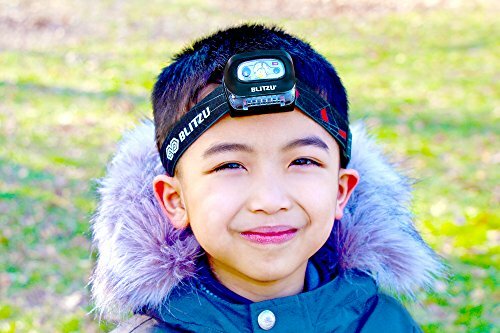 100% SATISFACTION GUARANTEE - We are so confident you will love our headlamp that we offer a Money Back Guarantee with a Lifetime Warranty!